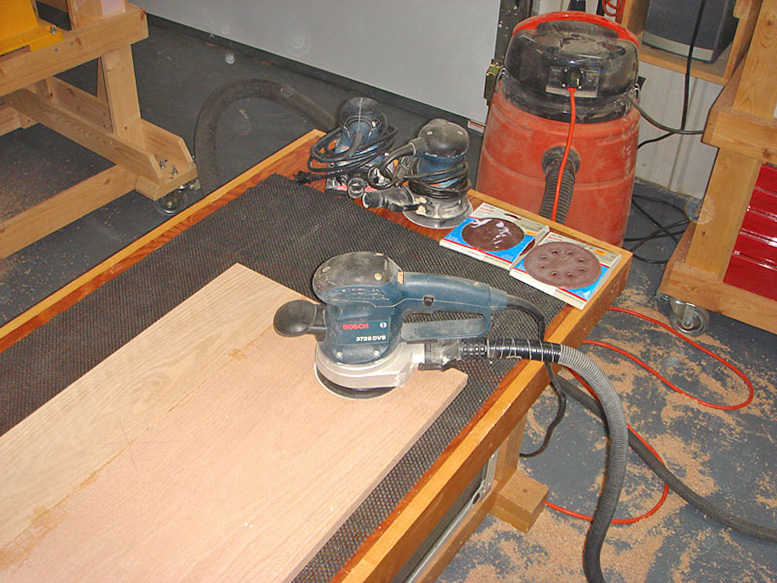 I use three sanders: a full-sized random orbit, a palm-sized random orbit for finer work, and a ¼-sheet sander for edge and finishing work. I hook them up to a FEIN shop vac, which is relatively quiet and does a great job of keeping most of the fine dust out of the air. I love to be immersed in the kind of fragrant, coarse saw dust that is caused by cutting and routing (like what you see on the floor in this photo), but don't like to breathe the really fine stuff that is caused by sanding. With oak I sand the faces down to 180 grit with the random orbit sanders. It feels really good to run your hands over a face that has been well sanded; it has an exquisite, warm smoothness. I also use a sanding block for hand finishing, especially curved edges and the sanding before the final coat of finish. I use 240 grit 3M Sandblaster for this. I was skeptical when 3M first introduced that line, but it really is a better sandpaper. In fact, the grit lasts longer than the backing when I'm working on curves and corners, so I add an additional backing of masking tape to increase its life. I sand on top of a rubberized pad to help hold the piece in place and to dampen the vibration. Still, after a long period of sanding like this, my fingers and hands continue tingling for a day or two.